Babies don’t need much when they first enter the world, but somehow it’s just so easy to go overboard for your home’s newest and tiniest resident. With the baby shower, the ease of one-click ordering on Amazon, and general anxiety about impending parenthood, you want to have everything you could possibly ever need—and then some. But in reality, how do you set up a functional nursery without crowding your tiny space and spending a fortune? 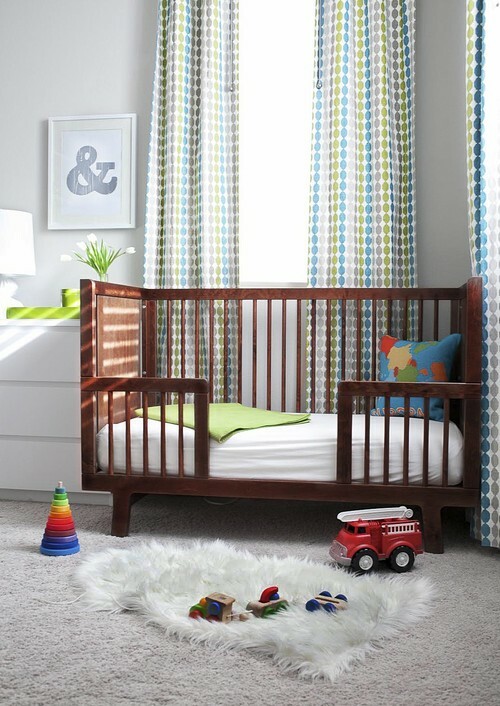 The key to a savvy baby room is to focus on space-saving decor and items that do double duty. “Face it, furniture is an investment, but if you purchase pieces that last longer than a year or two, you’ll have made a wise choice,” notes Karen Gray-Plaisted of Design Solutions KGP. And now’s the time to get what you want, before your child starts to form opinions about her favorite colors and styles. To help get ready for your bundle of joy—without breaking the bank—here are eight ways you can save space and still welcome your tot in style. Feeding duties will take up the bulk of a new mom’s time, second only to changing diapers, so it’s a good idea to pick up a chair that’s comfy and relaxing. Nursing gliders move smoothly, but some of them run hundreds of dollars, especially the upholstered, reclining styles. And you might be tempted to add the matching footstool, because, well, why not treat yourself? But in the end, selecting a seat that’ll work elsewhere in the home is smarter. 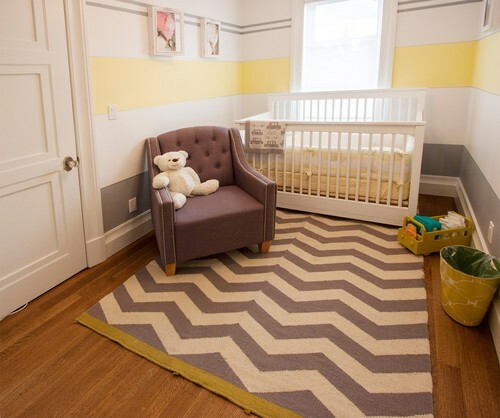 A simple wooden rocking chair will serve you well now, in the nursery, and also look great in the family room five years down the road, Gray-Plaisted notes. It might seem cute to get a smallish chest of drawers for those itty-bitty rompers, but a proper bureau will serve you better. “Get a dresser that provides plenty of storage space and is sturdy and safe, but that’s also big enough for when the baby grows out of his tiny outfits,” Gray-Plaisted says. Stick with a wood finish or at least skip pastels in favor of a primary color that’ll grow with your child. A basket on the floor takes up precious space, but one hung from a hook does not. Bonus points if you choose a simple laundry bag you already own, rather than a duck-themed baby version. The pros also love an over-the-door, plastic shoe caddy for holding burp cloths, diaper creams, and lotions. “Consider closet rod dividers that let you clip a disc label with clothing sizes for newborn, three months, and up,” she adds. Fancy diaper systems claim to banish odors, but most folks admit they can still sniff out a dirty nappy in the room. 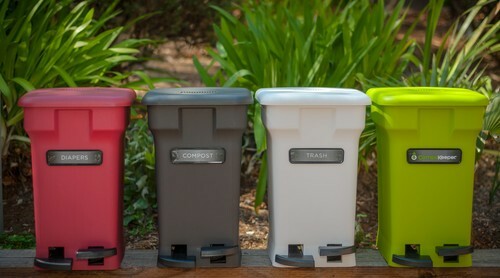 “Wrap up that diaper and toss it with your regular garbage each day,” Gray-Plaisted recommends. Set the tone with the right area rug, urges Kristin McGrath, editor and shopping expert at Offers.com. And if you pick one that’s on the grown-up side, it’ll last well into childhood. “Spending a bit more here is worth it, because you want something that repels spills, that’s easy to spot-clean, and is hefty enough that it doesn’t bunch up or buckle,” she explains. And you’ll want a carpet that’s soft underfoot as your tot will spend hours playing on it. 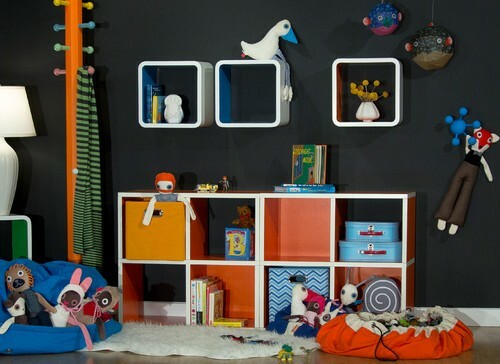 Wall space is often wasted, so put it to good use with a book rail or plate racks for books and toys. “It’s tempting to splurge on shelves with animal or nursery rhyme themes, but go with something more neutral,” McGrath suggests. A storage unit in a sophisticated color like mint green or soft gray holds trucks and blocks now—and then school supplies later on, she adds. Convertible cribs are a must-have in a baby nursery designed to save space and money. “The 4-in-1 cribs on the market now come with a changing station that converts to a toddler bed and nightstand—and then a daybed later on,” Novak explains. “Convertible pieces are fantastic, but because you won’t make the swap for years, be sure you note where you’ve stored the extra pieces,” she adds. Choose classic wood tones, either light or dark, depending on your style, and it’ll last for years. What’s the No. 1 storage problem new parents face? A surfeit of stuffed animals, Novak says. Fix this situation with simple cubbies or canvas bins, or try a toy hammock that keeps fluffy friends off the floor. Or check out “animal zoos,” which are boxes with elastic bars that allow toys to be pulled out and pushed right back in, she adds.